Taking the family and your dog camping in the great outdoors can be so much fun for all involved. Your dog can have as much fun as you and the rest of the family can. It will be able to romp and play with you like it can’t at home because you have to work so much. The fun can be even more when you setup next to a lake you can swim in. If your dog is like mine he loves to swim! You can take your dog for long walks through the area you have set up camp in. Go explore nature with your dog. Walk the paths through the woods and commune with nature. This will get both of you some exercise which will be good for your health. Your dog will love the attention too. Another fun activity when camping is swimming if you are by a lake. This way you can let your dog enjoy the water too. Put his lifejacket on so he can swim safely. This keeps something from happening in case he gets tired in the water. Dogs can even be trained to get up on a foam raft so they can float around. My dog just loves doing this when we go to the lake. At night around the campfire, your dog can lie down near it and warm its body. Also my dog is such a hoot and helps me break small branches up to use on the fire. She grabs the thin pieces of branch in her mouth and then takes her front paws and pushes down on them to break them. Oh how we laugh, it is such fun! She just started it out of the blue one time. Be sure to use only branches that have already fallen though. Most campgrounds permit this but will not permit you to bother living trees. Another big rule to remember for the safety of your dog is that on dry land he should always be on a leash. Even if you are not in a public campground your dog could take off and chase some wild critter and get hurt in the process. 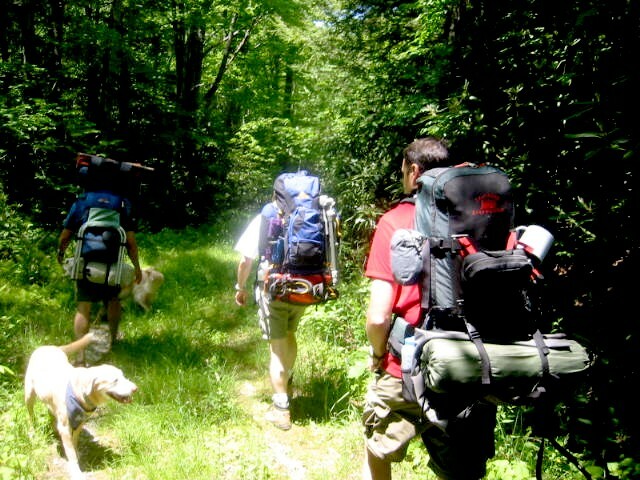 Most public campgrounds will have a rule about the dogs being on leashes and how long they can be. Make sure when you go camping with your dog that you have all of the flea and tick protection your dog needs. You need put it on the dog prior to going camping if you are using the top-spot applications or using a flea and tick collar, however, if you are using sprays you will need those with you on the campsite to apply probably more than once to protect your dog. Make sure the dog has their food from home when camping. This will prevent his system from being upset from a change of food. Make sure he has enough water to drink too with being outside and more active than usual too. Being outside with your dog is a great way to bond with him. Camping is a fun activity to do to accomplish this. It gives you both exercise and the fresh makes you both healthier too. Article written by Kelly for ohmydogsupplies.com – your source for dog coats and jackets, dog collars and other cool dog gear you won’t find at your local pet store.